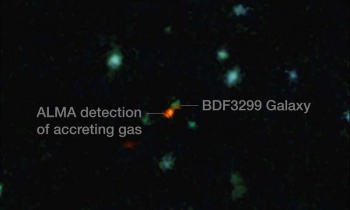 A photo of distant galaxy BDF3299 reveals a process that we could at one time only imagine: that of a galaxy being born in the wake of the Big Bang. As the comedian and relativist Mitch Hedberg said, "Every picture is of you when you were younger." True as that may be, it seems extra relevant when we talk about astronomical photos. An image captured yesterday can show you different objects as they were a year ago, a billion years ago, and 12 billion year ago - all in one picture. Take, for instance, the recent image of BDF3299, a galaxy that formed in the aftermath of the big bang. Just a scant 800 million years into the life of our universe, light from BDF's formation began travelling in our direction. The photo we can see was taken by ALMA and the Very Large Telescope, and for the first time shows the process of galactic assembly as it happens. Everybody loves a good galaxy photo. The full implications of this photo are explored in the Monthly Notices of the Royal Astronomical Society. It is hard to say that the image of lopsided BDF sheds light on an ancient mystery, since the researchers weren't looking for visible light from stars at all. They were searching instead for the faint glow of ionised carbon, which accumulates in clouds around stars as they are born. The thing is, shortly after the Big Bang (which occurred just under 14 billion years ago) the universe was an impenetrable fog of hydrogen gas. But as stars and quasars began to shine, they cleared away the mist in what astronomers refer to as the epoch of "re-ionisation." Very little is known about these first stars - up until now they have been nothing more than blurry blobs on black backdrops. The photo of BDF is still a blurry blob - but one that offers so much more information, as we can now see into the structure of its assembly. Who should we name Pluto's mountains after - Kirk or Spock? I'd be mortified if I were BDF 3299 - I go to a lot of trouble to hide photos of my early formation, and then some scientist comes and shows everybody how lopsided I looked? Way to go, science.